In today’s world, there are simply too many world-class young artists leaving school and falling through the cracks. What if there was a way to change that and impact society at the same time? Meet Collaborative Arts Ensemble (CAE), a classical arts production company dedicated to amplifying the voices of world-class emerging artists around important social issues in the world through cross-disciplinary concert programming. The concerts that CAE artists build defy genre and discipline. Each program is completely different both in the size of ensemble and the topic(s) the artists choose to explore within the performance. Programs are built from scratch in two to three week long paid rehearsal residencies and are then toured across the United States the following year. 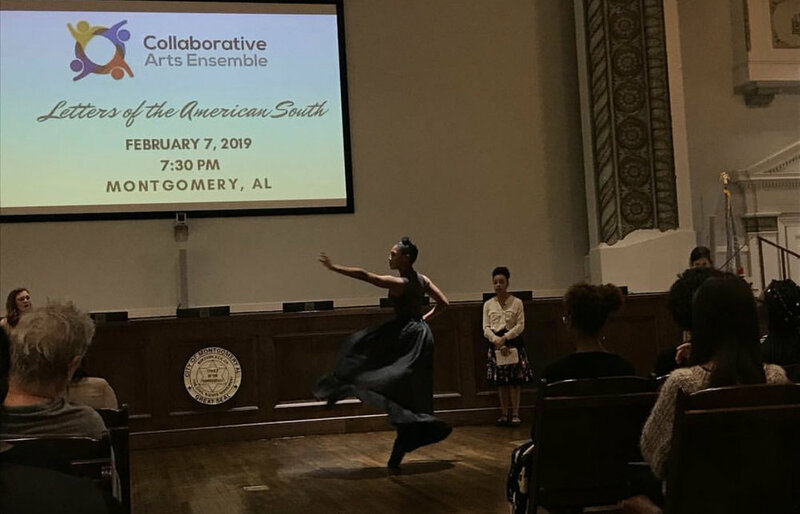 Generally, a CAE concert will combine both original and found text, music, and physical movement that speak to a time of history, a social issue or a specific question. CAE artists are also encouraged to share from outside of their own discipline (i.e. an opera singer that dances or a composer that sings) as CAE believes deeply in allowing the process of artists sharing in each other's stories and disciplines to dictate the form of its shows. Along with bringing our programs to premier concert venues, community centers, and libraries across the country, CAE artists are also committed to enhancing the arts education of youth in the communities it tours. With arts funding lacking in schools across the United States, CAE members believe in the importance of sharing their artistic experiences and skillsets with those who may not otherwise be able to experience these art forms. Furthermore, CAE hopes to encourage students, even at young ages, to think about how each of them wishes to create an impact in the world and to consider how they choose to interact with friends, family, and the communities in which they live. Our inaugural concert program, Letters of the American South, has toured in the states of Georgia and Alabama and was recently featured on Governor's Island in New York as part of the Rite of Summer Music Festival. Our newest program, The Bach Project, will begin touring in 2020. Collaborative Arts Ensemble is proud to be recipients of grant support from the Alan D. Marks Center at The Juilliard School, the From the Top Alumni Leadership Grant, and the Robert & Mercedes Eicholz Arts Entrepreneurship Prize. We are also grateful to have been in residence at Avaloch Farm Music Institute in Boscawen, NH this past June.